Our hearts, and our family’s, are completely open to loving another child and you can be comforted to know that our schedules are super conducive to raising multiple children. Both of us work exceptionally flexible schedules, with Tom working from home full-time, and Stephanie working from home two days a week. This means we will have all the time in the world to spend raising, loving, and simply getting to know your child, our adoptive child, as they grow. Before we embark on our journey of building an even more blended family, hopefully with your help, we’d like to tell you more about us first. Our relationship has been a “storybook” romance of sorts. Though we have been together for 12 years and married for eight, it feels like we have always known one another. Mutual friends set us up in the spring of 2005 and we realized right away that our relationship would be special. We immediately bonded over our shared love of books, food, and an obsession with Patriots quarterback Tom Brady. 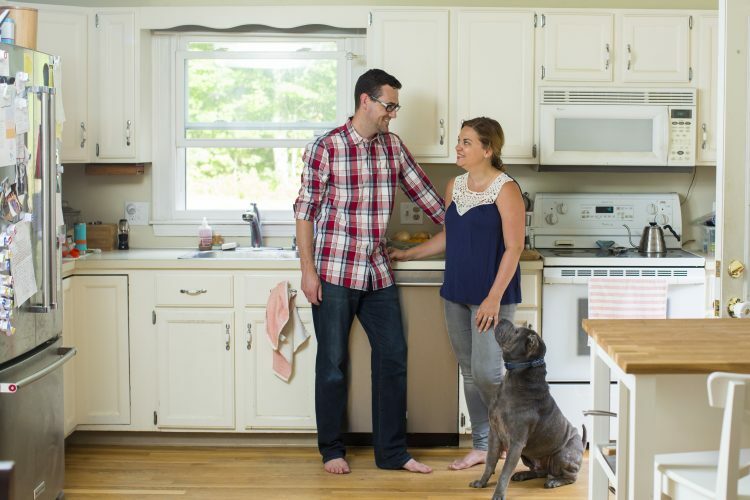 After dating for 18 months, we moved in together in the suburbs of Boston and found living together was even more fun than dating. Two years later, on my 29th birthday, after we had spent a beautiful day exploring the Cliff Walk in Newport, Rhode Island, we arrived home and I opened my birthday present from Tom to find a hardcover copy of the Anita Shreve book, “A Wedding in December.” It was a book I already owned and I was amused and mildly annoyed; this was something Tom did often – buy me books I already owned. He would see a book at the store, recognize the title, and think that it was one I wanted to read. Instead, the title would be familiar to him because he had subconsciously noticed a copy I had already read sitting in a bookcase at home! This time, although I didn’t know it yet, he had gotten me a book I had already read on purpose. When I told him I already had the book, he apologized profusely and begged me to at least look at the cute puppy bookmark he had bought. 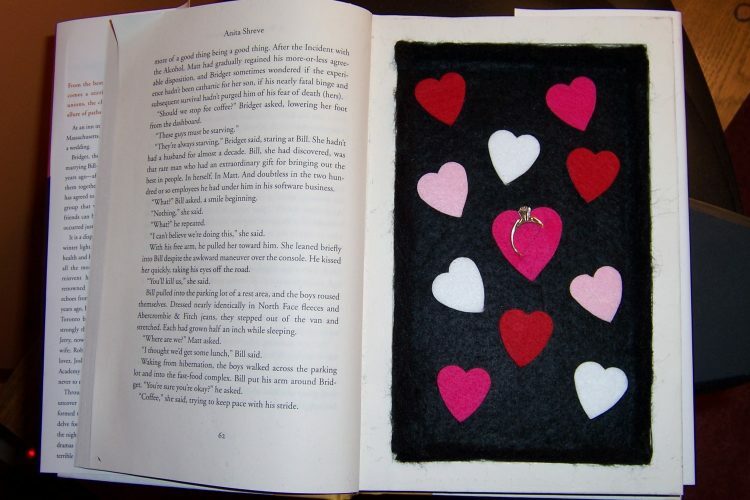 When I opened to the page with the bookmark, I found the book was hollowed out and lined with black felt and hearts, with an engagement ring in the center. It was the perfect proposal for a book lover like me. He later explained that he picked a book I had already read because he didn’t want to cut the pages out of a book I hadn’t read yet – which was even sweeter! 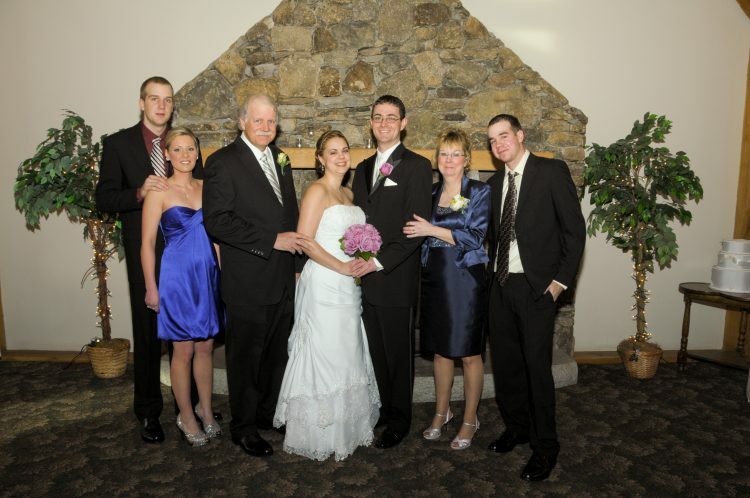 We got married in February 2009 in front of 90 of our closest family and friends. Soon after, we welcomed our fur-baby, Winston, a seven-week-old Chinese Shar-Pei puppy, into our family. Winston loves people and especially likes to sniff and lick them. He is a very spoiled and loyal pup. We enjoyed taking Winston to puppy training classes, the local dog park, and watching him grow, but raising him made us realize we couldn’t wait to be parents to an actual child. We had always talked about having multiple children. 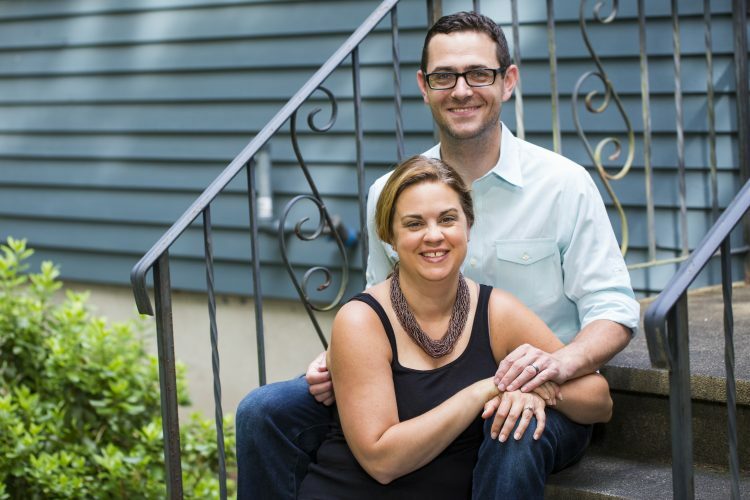 After trying unsuccessfully to conceive on our own, we started fertility treatments. Several years, many treatments, and two heartbreaking miscarriages later, we found out, on my birthday in 2013, that we were pregnant with our son Caiden. 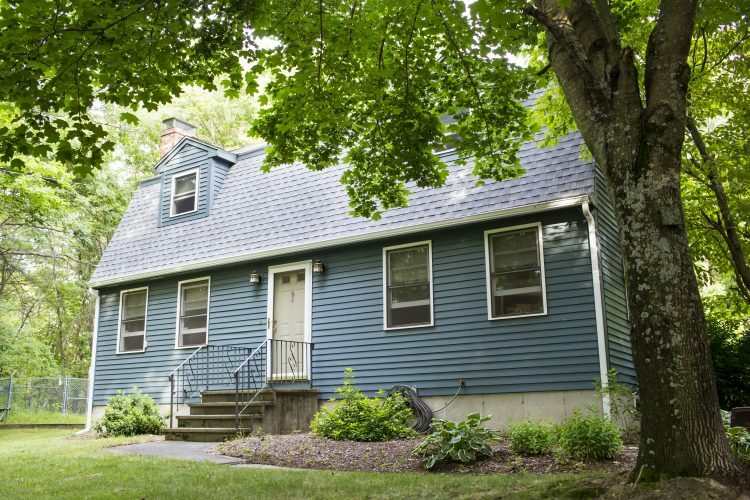 In 2011, we bought a single-family home on a quiet, dead-end road, in a nice suburban Massachusetts town. We have about an acre of land, mostly open space, which is surrounded by woods – all of which are great spaces for a child to play. The woods are filled with hiking trails and, in the summer-time, we often take Caiden and Winston exploring. There is plenty of room for children to stretch out, run around, and simply discover. While this open space is great for playing, we are also planning to install a basketball hoop and a wooden swing set in the backyard, where someday Caiden and his sibling can spend good-weather days sliding, swinging, and shooting hoops. There are several other families with young children in our neighborhood who I’m sure would love to come over and join in on the fun. In addition to our neighborhood being an ideal place for a child to grow, learn, and explore, our town is safe, quiet, and has an excellent public school system (it is consistently rated in the top 50 in the state). Locally, we also have access to a wide range of artistic and athletic activities. We have enjoyed taking Caiden to music, gymnastics, and swim classes and we can’t wait to adopt so we can share these experiences with another child, all the while learning what he or she enjoys and gravitates towards. We will always encourage our children to try new experiences and to do what makes them happy. Tom has bachelor’s and master’s degrees in mechanical engineering. He is currently working for a tiny start-up, founded by a close friend, implementing cybersecurity for nuclear power plants. The firm is based in Maryland, but he can work from home full-time, as the firm is extremely supportive of working families. This means that his schedule is incredibly flexible so he can spend a lot of time at home bonding with our adoptive child during the early years and as he or she grows older. Stephanie earned her Bachelor of Arts in English with a concentration in creative writing. She spent 13 years as a writer, reporter, and editor in the newspaper industry. She currently works in the communications department of a company that does market research on high tech products. Stephanie is in the office three days a week and works from home the other two days. Her job offers her four months of leave, which she will take to care for your child when he or she is born. Her work hours are also incredibly flexible, so when the children start school she will be able to adjust her schedule to be home when they are and so she can attend every school play, concert, and sports game. I was born and raised about 30 minutes south of Boston, along with my five siblings: a sister, two older brothers, and two younger brothers. The three oldest are my half-siblings from my mom’s first marriage, but we were all raised by my mom and dad. 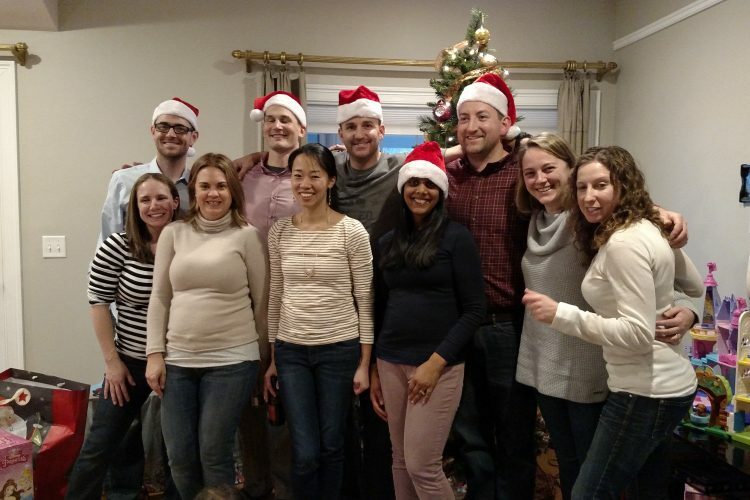 Our family has grown even larger over the years, and now I have eight nephews and a niece. Most of my family lives nearby, within an hour driving. Caiden and his cousins love to spend summer weekends swimming at my oldest brother’s pool, where we also have our annual family reunion for the extended clan on the Fourth of July. Though I love the Fourth of July pool party, Thanksgiving Day is my favorite holiday and it is always a large, crazy, loud affair with my entire family. I’m excited to share Turkey Day with my future child – eating turkey, watching the football game, and simply laughing with the rest of our family. My parents, “Mimi and Papa” to all the kids, love spending time with their grandchildren and are very excited to welcome a new little one into the family. Up until Caiden was nearly two, they came to our house to watch him two days a week. They still spend a lot of time with him now, bringing him to the playground and reading him stories; they are looking forward to doing both of these things and more with Caiden’s sibling once that time comes. When Caiden turned a year and a half old, we started our own family tradition. Every summer we spend the week on Cape Cod, along with our friends and their 4-year-old daughter. There we spend the week swimming, building sandcastles, and flying kites at the beach. We can’t wait to help our newest little one build their first sandcastle and swim in the ocean for the first time. I grew up in a small town outside of Worcester with my mom, step-dad, and two younger half-brothers. One of my brothers still lives in the Worcester area and my parents and other brother live in South Carolina, near the ocean. We visit them whenever we can and love going to play in the waves and the sand with them. “Mimaw and Grampy,” as Caiden calls them, are so excited to meet our new baby, hopefully your child, so they can share their love of the beach with him or her as well. Though my parents are a little farther away, I am very close with my Gram and we try to visit with her once a month or so. We often pick her up and bring her to my aunt’s house for dinner, but no matter what we do she is always an amazing presence to be around. Some of my best childhood memories are from going to Disneyworld with her. Tom has never been to Disneyworld, but going to Disney with my Gram was such a huge part of my childhood that I’ve already told him we’re taking the kids as soon as they are old enough – maybe Gram will come with us too to keep up the tradition! As for other family traditions, we spend Christmas day at home, opening gifts and enjoying a tasty breakfast together. Then we host my Gram, aunt, and uncle for dinner and Tom’s parents join us for dessert. I’m like a little kid at Christmas (I especially love filling stockings for everyone to open) and I can’t wait to make cookies, open presents, and listen to Christmas carols with our newest little one! Though Tom has already shared that Thanksgiving is his favorite holiday and I’ve told you Christmas is mine, Halloween has become Caiden’s favorite holiday. On Halloween, we go trick-or-treating with our whole group of friends and their children. We break out the wagons for the little ones and the bigger kids run up to the houses together. We can’t wait for a future child to get in on the fun and treats! When I first met Tom, I knew we were meant to be. From the very beginning, it felt as if we had known each other for years rather than days. He is my rock in times of crises and my partner in the many adventures we have already gone on and will go on in the future. Another thing I knew from the very beginning is that Tom would be a kind and loving father. He can often be found playing a game of monster (where Caiden hides underneath a blanket giggling and Tom stalks around the house pretending to be a monster) and he has a great reading voice for bedtime stories, often making up different voices for each of the characters in a book. He is a natural athlete and enjoys many outdoor activities, including softball, golf, and running, so he is excited to play any kind of sport with our son and future adoptive child. Tom also enjoys doing home improvement projects and it is only a rare occurrence that we need to call in a professional to fix what he has done. Tom is also the rational one, the bookkeeper, and lover of a good excel spreadsheet. I know our children, current and future, will be lucky to have him as their dad. Looking back over the past 12 years, I am so lucky to have a partner like Stephanie. Stephanie is absolutely my best friend. One trait that I love about Stephanie is how empathetic she is. She has a knack for knowing when you need someone to commiserate with, someone to cheer you up, or even when you just need a hug – a feature I believe makes her an amazing mother. She is also quick to smile or laugh, and she makes even doing mundane tasks fun. I joke with her that I knew she was “the one” when I realized that I didn’t mind grocery shopping (my all-time least favorite chore) if we were going together. Well-read and curious about the world, she can talk to you about anything and is equally comfortable talking about politics or the latest celebrity gossip; she can talk to anyone about anything. Stephanie also loves to cook, a hobby she has cultivated over our time together. She is such a great cook that I maintain that sitting down together for a bowl of her homemade mac and cheese is the best medicine for easing the frustration of a rough day at work or school. While she is a fantastic cook, she is an even better mother. From the moment Caiden was born, I’ve been continuously amazed by her comfort and grace as a mom. Whatever the situation, she is a calm and confident caregiver, who knows just what to do in any situation. From day one she looked like she had been cuddling babies for years, so I know your child will be in good hands with her. We’re so grateful to have Caiden in our lives, but we always knew we wanted to have more than one child. Since we both grew up with siblings, we always knew that we wanted Caiden to have siblings too. After having Caiden and doing much soul searching, we decided to focus on adoption instead of continuing with more infertility treatments. We were fortunate to be able to speak with several other families, who had adopted children, about their experiences. One of Caiden’s daycare teachers also shared her experience as an adopted person with us. These conversations reinforced our belief that adoption was the path we were meant to take, which is why we are writing this letter to you now. Though we cannot begin to understand what you are going through right now, we want to thank you from the bottom of our hearts for considering us as your child’s adoptive parents. We want you to know that if you select us, we are open to whatever level of communication you would like and we will be proud to openly talk about you with your child, so he or she will know how the difficult decision you made helped them become a part of our family.